One of the benefits of living in a big city like London is that there’s so much to do. One of my favourite things to do with my boyfriend is going for dinner and going to the cinema. Last week, I got to do both! The wonderful Genesis Cinema down in Whitechapel offers £4.50 tickets on Mondays and Wednesdays – easily the cheapest tickets I’ve found for any cinema in London and you get the added bonus of supporting an independent cinema. My boyfriend and I both wanted to go and see Grimsby, as we both really liked Borat, and decided to go for dinner before the movie. I had spotted a diner under construction near Aldgate East station and suggested we go and try it as it had just opened. 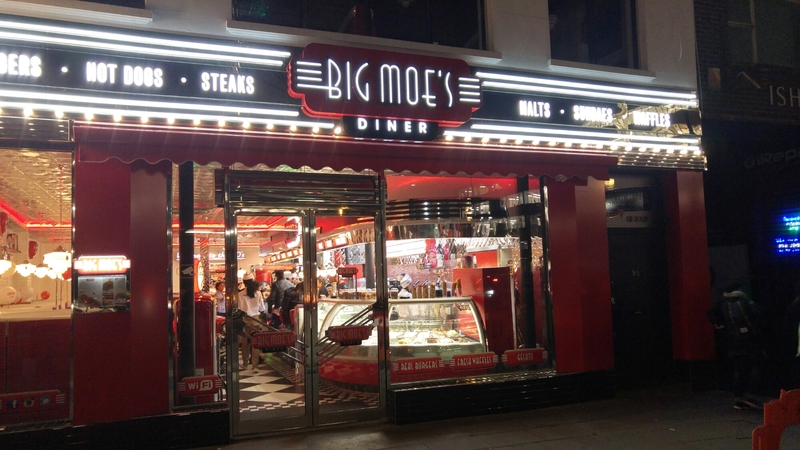 Big Moe’s Diner is a 50s style diner, think along the lines of Ed’s Easy Diner… but better. Tu can see just how much work they’ve put into the place. There’s a real car in the middle of the restaurant, straight out of the 50s and turned into a booth. 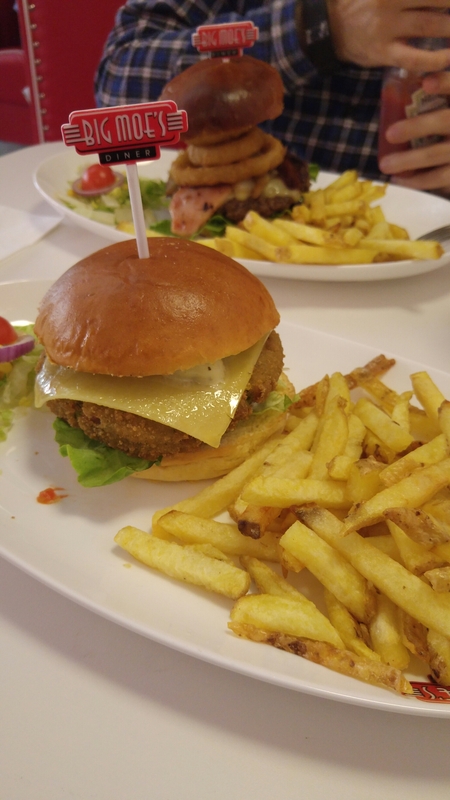 The food is incredibly fresh – my boyfriend said he hasn’t tasted meat as fresh as that in a long time, and my veggie burger was also delicious. They say on the menu that they don’t cook from frozen and their fries are hand cut every day… and it shows. One thing that I thought was a particularly nice touch was that the burgers come with fries. I find it a bit of a money making trick that restaurants charge you separately for fries, so it’s nice to see somewhere just trying to provide good food at reasonable prices (about £8/9 for a burger and fries), without any little irks like that. If you find yourself in the area, I’d definitely recommend checking it out. Whitechapel/Aldgate area has always been somewhere I’ve found a bit lacking for quality restaurants, and would normally stay up around the Shoreditch end, but Big Moe’s is worth a visit. The movie was less pleasant than the dinner – I’m a bit squeamish at the best of times, and while there were some funny bits, there were also some truly disgusting bits that I had to look away for. If you’re looking for easy laughs and something lighthearted, I’d say go for it, but don’t expect celluloid literature. Overall though, it was a really nice evening, and always lovely to spend time with the boy.